24 keymilwaukee.com for tour schedule. 2714 W. Burnham St. (414) 368-0060 LANDMARKS Black Cat Alley Street art space by artists from around the world. Kenilworth & Prospect Ave. Bronze Fonz Statue of Arthur (The Fonz) from the "Happy Days" television series. Milwaukee's RiverWalk, South of W. Wells St. Potawatomi Hotel & Casino Features 2,500 slot machines, 100 table games, bingo, poker, off-track betting, plus seven unique restaurants, the intimate Northern Lights Theater, banquet space of over 60,000 square feet and a 19-story luxury hotel. Open 24 hours a day. paysbig.com 1721 W. Canal St. Schuster Mansion Bed & Breakfast Tour a mansion built in 1891 or enjoy Mollie's Tea where you will be entertained with history/ stories while sipping tea. (By appointment only). 3209 W. Wells St. (414) 342-3210 St. Josaphat Basilica Features one of the five largest domes in the world. 601 W. Lincoln Ave. Tripoli Shrine Center 3000 W. Wisconsin Ave. (414) 933-4700 PARKS Boerner Botanical Gardens/ Whitnall Park Fifty-two acres of formal gardens. Garden hours are 8am–6pm, seven days a week. 9400 Boerner Dr., Hales Corners. (414) 525-5600. Lakeshore State Park 17-acre park located on Lake Michigan. Adjacent to Discovery World. (414) 273-1173. Lapham Peak Seventeen miles of hiking. Meander through a beautiful moraine landscape of rolling hills. W329-N846 County Highway C, Delafield. Lynden Sculpture Garden Experience a collection of more than 50 monumental sculptures. 10am- 5pm, closed Thurs. lyndensculpturegarden.org 2145 W. Brown Deer Rd. 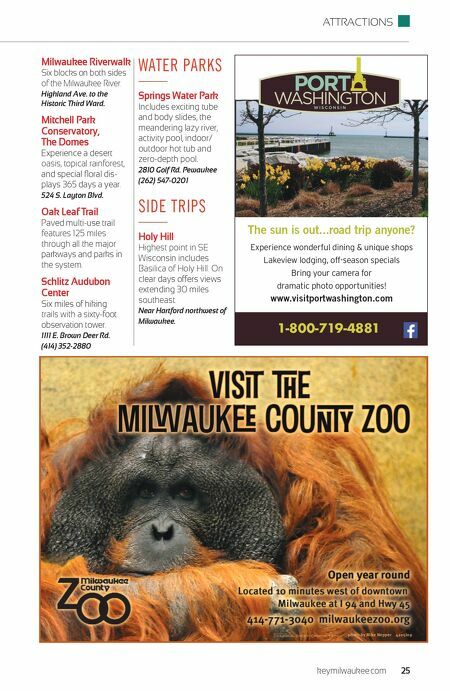 (414) 446-8794 Milwaukee County Zoo Home to 2,100 rare and wild animals. Open daily 9am-4:30pm. Animal buildings close 15 minutes prior to zoo closing time. Open 365 days a year. milwaukeezoo.org 10001 W. Bluemound Rd. (414) 771-3040 g ATTRACTIONS & historicmilwaukee.org 414.277.7795 historic milwaukee, inc. presents SKYWAUKEE Saturdays at 11 AM or 1 PM Meet @ Grand Ave. Mall explore Milwaukee's Downtown from a new perspective - the Skywalk system! 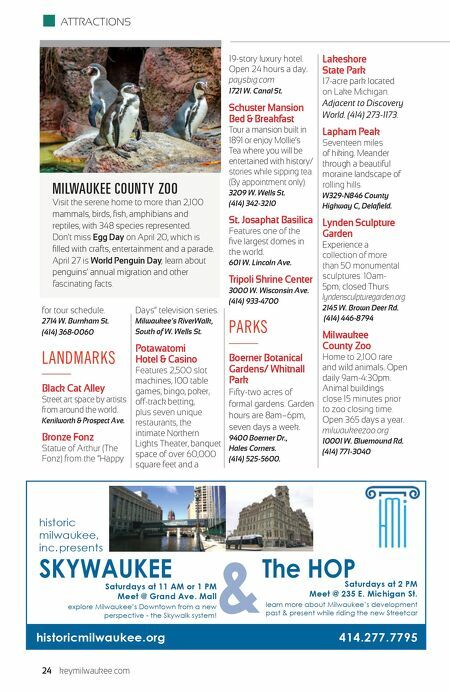 The HOP learn more about Milwaukee's development past & present while riding the new Streetcar Saturdays at 2 PM Meet @ 235 E. Michigan St. MILWAUKEE COUNTY ZOO Visit the serene home to more than 2,100 mammals, birds, fish, amphibians and reptiles, with 348 species represented. Don't miss Egg Day on April 20, which is filled with crafts, entertainment and a parade. April 27 is World Penguin Day, learn about penguins' annual migration and other fascinating facts.